It’s one of those books you want to read with your book club and then dive in a discussion about this mother’s choices. It is one where it is unclear what the right or wrong answers are. In this story, Eve Lattimore’s family is like every other on their suburban street, with one exception. Her son Tyler has a rare medical condition that makes him fatally sensitive to light, which means heavy curtains and deadlocked doors protect him during the day and he can never leave the house except at night. For Eve, only constant vigilance stands between an increasingly restless teenage son and the dangers of the outside world. This book is deeply moving and suspenseful. I sat down with it and I could not put it down until I shut it two days later. I would recommend this book for fans of Defending Jacob, The Husband’s Secret, or My Sister’s Keeper. Now hurry up and grab that cup of coffee and enjoy this beautiful interview with Carla Buckley! Fourteen-year-old Tyler suffers from xeroderma pigmentosum, a genetic condition that means he must avoid any exposure to the sun or any UV light. How did you first hear about this condition and what prompted the idea for creating a story around this condition? What type of research did you do to prepare for what it would be like to live with this condition or be a family member who lives with someone who has XP? When my son was sixteen and had just gotten his driver’s license, I had mixed feelings as I watched him drive away that very first time. He’d worked hard and proven himself to be responsible and I was proud as I watched him carefully back the car out of our driveway. But I also felt sad. He wasn’t just driving himself to his guitar lesson. He was taking a critical first step to becoming a man and leaving home forever. I began to wonder what it would be like to mother a child who could never reach this sort of milestone. It occurred to me that this normal, turbulent, and always challenging period of a boy’s growing up would be complicated immeasurably if he had a medical condition. But which one? My sister, an ER physician, suggested Xeroderma pigmentosum (XP) and as soon as she said the words, I saw my story start to unfold. XP’s an extraordinarily rare disease passed on by both parents in which a person’s skin and eye cells cannot repair the deadly damage done by ultraviolet radiation. Most parents don’t realize they’re carriers until their child is diagnosed, usually by the time their child is two years old. But by then, the damage has already been done. The average life expectancy for someone born with XP is twenty years. In order to understand the disease itself, I scoured online resources (there are two parent-run organizations, one in the US and the other in the UK that offer general information to caregivers), read numerous medical research papers, and interviewed dermatologists and dentists. Combined, this gave me a basic foundation upon which to build. Then I began to put myself in Eve’s place to imagine what I would do if I had to keep my child safe from sunlight. Eve struggles with the moral decision of coming forward with information when her best friend’s child goes missing because she thinks keeping it secret can protect her family. Do you think you would have kept the deepest secret, personally, or would you have taken different actions than Eve? If only there were a users’ manual for raising children. Failing that, we all write our own, cobbled together from experiences that range from “Okay, remember that the next time this happens” to “Boy, I wish I hadn’t done that.” If we’re lucky, our children survive our mistakes with just a few scars. Sometimes I think parenting is like throwing darts and praying they hit the wall and not a few innocent bystanders. That’s what I wanted to show in THE DEEPEST SECRET. Most of us are just doing the best we can, and we’re not perfect. Eve’s circumstances are difficult, if not impossible, and she’s going to make mistakes. But she’s also going to do some things incredibly right. My hope is that readers will recognize something of themselves in her, whether or not they agree with her choices. I’m not sure what I would have done if I had been Eve. I hope I never face that kind of dilemma. There are a lot of secrets throughout the book and many of them focus on the neighbors and Tyler capturing some of those secret lives through photography when they are unaware in their windows. The book also builds to a big scene were the neighbors are disagreeing and then spilling those secrets out onto the pavement to each other. It made me think how little we know our own neighbors, especially today. What made building this neighborhood such a big part of the Lattimore’s story and was it difficult to develop so many plotlines for so many people? I’ve always thought there was something magical about a neighborhood at night, all the house windows glowing brightly in the darkness. When I’m out walking my dogs, I sometimes catch a glimpse of a family eating dinner or watching television. From a distance, it all looks so cozy and cheerful. My children had a piano teacher whose house we visited for lessons. Her home was tidy and filled with photographs of her smiling children. She had something delicious-smelling simmering on the stove, and she laughed easily. One sunny afternoon, her oldest son wandered down the street with a knife in his hand, headed for her house. She didn’t survive the assault and neither did another child home at the time. I had been in her kitchen just the day before and had chatted with her son, and I’d had absolutely no inkling that anything was wrong. It’s haunted me for a long time. What do we really know about the people in our life, about the houses we visit during the day and pass at night? Coming up with so many secrets was a challenge. I had to ask myself over and over why someone would hide a part of their life. I searched for the kinds of quiet secrets I believe every neighborhood contains. I admit to being an overly-protective mother and I could relate so much to Eve’s desire to protect Tyler with his medical circumstance. Did you relate to Eve in this way or did you find her overprotectiveness to be extreme? The first time I heard the term “helicopter parenting,” I thought it meant a parent who dropped in every so often as needed, like a Medevac. I think that’s the real challenge parents face today—knowing when to be present and when to step back. I don’t think the world is any more dangerous today than it was a generation ago, but the dangers are different and we’re more aware of them. A parent can become almost paralyzed by too much knowledge. Personally, I do tend toward being an overprotective mother. I’d love to lock my children in a room until they were twenty-five but even if I could, I know it would backfire. Kids are smart—they can fool you into thinking you know what they’re up to. The trick is to give them just enough freedom so they can make a few mistakes and learn a few life lessons that will keep them safe. There’s a lot of trust involved—on both sides. I will not say anything about the ending because I don’t want to spoil the book for our readers. Would you say you were pleased though with how this story wrapped up? Did you always envision this to be the ending for this family? Actually, coming up with the ending was the single greatest challenge I faced in writing this novel. The ending I initially envisioned turned out to be far too melodramatic and I was forced to pull and consider what I was really trying to say in THE DEEPEST SECRET. It’s this: I wanted to write about love in all its guises and show how love prevails, regardless of the obstacles it faces. That’s the note I decided to end this story on and I admit to getting a little teary every time I think of it. Oh, I love talking about books! There are three novels that inspired me as I wrote THE DEEPEST SECRET: Emma Donaghue’s ROOM, Anna Quindlen’s EVERY LAST ONE, and Elizabeth Strout’s OLIVE KITTERIDGE. Just a few days ago, I finished Laline Paull’s fabulous debut, THE BEES; I can’t recommend it highly enough. 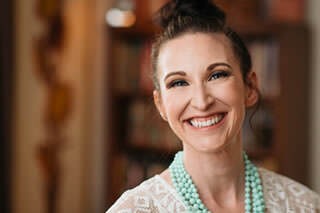 You can connect with Carla Buckley on Facebook or on her website! I’m always thankful for these moments with writers and I hope you will pick up this amazing book! You can always connect with me on GoodReads,through our books section of our site, and you can read our entire Sundays With Writers series for more author profiles. Happy reading, friends!